Some people describe the sensation of flying FPV racing drones as similar to a drug – it gives you a high that you have to experience to understand. That would certainly explain why the hobby and sport of FPV drone racing has taken off and become so popular in recent years. However, the challenge with flying FPV is that you really need a big, controlled space to do it safely. With no real peripheral vision when you wear the goggles, it is easy for things to go awry and crash into something or someone unexpectedly. And until recently, the class of FPV racers available were mostly 250 millimeters in size, which are fairly large and heavy, requiring plenty of space and clearance to fly. But that seems to be changing. 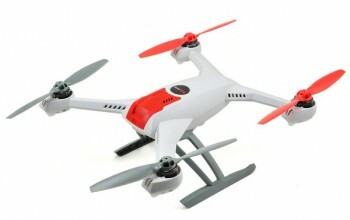 Today there are a wide variety of smaller, lighter and very nimble FPV quadcopters that are coming onto the market. This means more options to fly in smaller spaces, more chances to practice and hopefully more growth of the sport! This review is for one of the new breed of FPV racing quads that has recently hit the market, the Storm Racing Drone RotorX RX122 Atom from HeliPal. HeliPal has built a good reputation as a leader in ready to fly (RTF) quadcopters. They build the quadcopters and test them before sending them out to ensure that they truly are ready to fly when the customer gets them. The RX122 Atom came to me from China and, while it was fully assembled, I still experienced some challenges in getting it ready for its first flight. The RX122 Atom is small. Of course the number 122 in the name indicates the distance, in millimeters diagonally between the brushless motors. And while I know intellectually that 122 millimeters is a pretty small distance, I was still surprised by how small the quadcopter looked when I opened the box. But despite its diminutive size, this quad packs some really great features. First, it takes a 4S battery. This is amazing considering how small and light it is, weighing in at just 215 grams including the battery. Of course, the lack of mass and weight means that you don’t have to worry about putting a FAA number on it (if you are in the US) because it is under the threshold for that requirement. The 3100kv motors are very responsive and powerful. It has three flight modes and a built in buzzer for low battery warning as well as for locating the drone should you lose it in trees, grass, etc. This little quad also features an amazing 200mw video transmitter that sends out a very clear image over the 5.8Ghz frequency that many popular FPV goggles, like Fat Sharks, work with. There are, however, some challenges with the FPV and some other items that I will address below. The FPV Atom is a solid little quad. Its carbon fiber frame and tightly assembled parts seem thought out and even after several crashes, the only damage has been some broken propellers. The propellers are easy enough to get on and off with the included driver. However, there are a couple of items that seem to be lacking in quality and thought. First and foremost, the quadcopter uses a battery with a XT30 connector. This is fine and makes sense based on its size. However, HeliPal shipped the quad with a charger for the more common XT60 connector, which is too big for the included batteries. This means that my first day of flying was on half charged (from the factory) batteries. This was easy enough to remedy by ordering a XT30 to banana plug adapter for my charger, but c’mon HeliPal – you should have included the right adapter so that I could charge my battery. Hopefully this oversight was just on my order and not everyone is receiving their new toy without the ability to charge the batteries! The next thing that really surprises me (and not in a good way) is the amount of time you have to take in order to properly mount the battery to the bottom of the aircraft. HeliPal does include plenty of Velcro battery straps, but it takes some time to get the battery placed in the right spot without any of the propellers hitting the straps. The clearance from the propellers is very small and if you don’t get the battery strap in just the right place your propellers will cut the straps to shreds and possibly burn out your motors. So be aware of this as you put on the battery. Finally, the FPV signal, while strong using the 200mw transmitter, and full of great data because of the rich on screen display OSD that is preconfigured, is upside down! Yes, the video appears upside down in the goggles. I was able to work around this issue by actually wearing the goggles upside down on my face, which kind of worked, but is far less than ideal. I believe there must be a software fix for this and am hoping that I will be able to change some settings in the flight control software (CleanFlight), but as of this writing, I have not figured out this annoying little problem. As I mentioned before, the quadcopter comes assembled and pretty much ready to fly. Of course, you need the XT30 cable in order to charge the batteries, which mine did not include, but assuming you have the right charging cable, getting set up should not take too long. The drone comes already bound to the included Taranis transmitter and responds right away when you turn them both on. The instruction manual is somewhat lacking but it does explain how to arm and disarm the motors as well as what setting switches change the different flight modes. I highly recommend starting in the easiest flight mode, which on this bird is called “Angle Mode”. It give you auto-level and won’t allow the quad to tip past a certain point, making your initial flight easy and giving you a chance to get used to the quadcopter. The next thing to consider is where you place to Atom for takeoff. I mention this for two reasons. First, the Atom sits very low to the ground, so any grass, sticks, etc. will interfere with takeoff. Second, with the battery strapped to the bottom, the Atom does not tend to sit level, which means it may need to be held level so that the accelerometers and gyros can properly calibrate before you take off. Don’t make the mistake of calibrating them when the drone is sitting at an angle! This will lead to a bad flight experience. Despite my complaints about the FPV being upside down, the battery taking a while to mount and the lack of a XT30 connector for the batteries, this quadcopter makes up for a lot of that in the air. It is very responsive agile and smooth to fly. I first flew it around without my goggles to get the hang of it, a practice I strongly recommend. However, this quad only has one LED on the back and it is very small, so orientation is hard to maintain when it gets more than a few feet away from you. It was really meant to be flown FPV and it does quite well flying it that way. My first flights were in a grove of oak trees and I was able to maneuver it through them without much trouble as soon as I took off. That’s not to say that this is a good beginner FPV racer, I would definitely put it into the advanced-beginner or above category when it comes to piloting. One challenge is how much power to weight it has. It would be very easy to fly way too fast right out of the gate. Spend some time getting used to it and testing its capabilities before you push it. One other comment about the FPV: As I mentioned before, even though the image displays upside down (hoping this is fixable), the signal is very strong and clear with minimal dropout. One small complaint is the response of the camera to adjust between darker and lighter areas. My flight included shade and trees but also included a clearing that, when I flew into it, made the screen go almost white for a second or two before the camera could adjust the exposure. Not a major problem but be aware of that as you fly between light and dark environments! Quality issues from HeliPal – missing XT30 cable, FPV upside down, etc. While I own several 250 FPV racers and even some smaller indoor FPV practice drones, this is my first tiny outdoor brushless racer. And while I really like the idea of it and the way it flies, I’m disappointed by the lack of attention to detail from HeliPal. I have ordered from them before and had a very good experience, so I’m hoping the issues I had will not continue for other people. If you are looking for a great little FPV racer that you can fly almost anywhere, this is a good option. Just be sure you go into it with your goggles on and eyes wide open!